It’s safe to say the content count for this one was pretty big… or at least we thought so. Alongside our camelpacks, mountains of Oneballs and endless supply of nutbutter joined 1 camera, 4 GoPros and one Nikon 360. You of course mustn’t forget all the cables and charging devices that came with them! Now we actually carried three of these, for no reason other than that’s how many we had. With three musketeers touring China it made sense that each of us had one to hand to make sure we missed not one thing. Who got the one with the screen was simply just luck on the day! For those of you that aren’t totally immersed in the GoPro generation these are by no means the newest, or the techiest piece of kit. In fact we picked all three of these up about 2 years ago! Saying that, the quality is top spec, and we hardly struggled with noise control… as long as we remembered to remove the case! You’d think the lack of screen would be a royal pain, especially when compared to one that did. Actually it was simple to connect to your phone via bluetooth, enabling you to use your phone screen to see what you were filming, no wifi needed! You can pick up these slightly more mature versions of the micro cam from just £250 on either Amazon or Ebay. As smug as our earlier claim seemed, relying on vintage technology to carry us through the multimedia age, we have a confession. The airport duty free lulled us in and we caved to the oh so shiny newer model. I mean, have you seen it? The GoPro Hero Session 5 is tiny as they come, but still packed with all the power and clever camera skills one needs to capture true adventure. Featuring snazzy ‘one button controls all’ tech and hands free control, there’s almost argument to suggest TTH could go solo! Small but might, the hero 5 session captures 10MP photo and 4k video, all whilst ensuring advanced video stabilization. For those of us who don’t like long words, it’s keeps the wobble to a minimum. In all honesty we were totally blown away by this pocket sized powerhouse, and don’t regret a penny of the £299.99 it cost us! As great as the GoPro is, sometimes we crave full exposure, and no not what you foul mouthed fools are thinking. We mean we want to really expose our audience to what we witnessed and the Nikon 360 from Jessops allows us to do just that! Not only can you capture the experience in direction you’re facing, you can accompany that with a full 360 view. 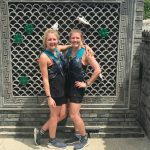 Picture this… Two teeny tiny blondes clambering through an ancient archway along The Great Wall of China, miles from anything or anyone with just our rucksacks and matching other to keep us company… well now you can! The Nikon 360 means you can follow us wherever we go, spinning yourself round to spot what’s to our right, left and all around meaning we really can take you on any adventure we come across. Waterproof, shockproof, freeze-proof and dustproof – this is your rugged, dependable companion for all of life’s adventures, and all the daily clumsy happenings. If you’re not sure what 360 kit you need/ or if you want to try before you buy, make sure you head to a Jessops store where they allow you to play with the kit in store and asking any burning questions to their expert staff. For the moments too good to miss, we turned to our trusty Canon camera, also stepping up when we turned to capture our Beijing highlights on video. When looking for a camera we looked for something simple, stable and easy to snap with… this was just that! With 18-megapixel CMOS sensor and interchangeable lenses it catered to our novice nature, but also our willingness to learn and develop our skills. It’s tiny, light AND features a 180 degree flip screen meaning we’re never far from a selfie or a vlog! It’s the perfect partner to what has now become a TTH trio! We highly recommend this as a first camera, it certainly played the part perfectly for us!